Last year on the feast of St. Ignatius , July 31, we enjoyed this delicious cake, which was baked by my friend Marci , at Summer with the Saints. The recipe came from Cooking with the Saints . Use an ungreased large round cake pan, about 10 inches (25 cm) in diameter and 5 inches high. Pour in the mixture. Preheat oven to 350°F (175°C) and bake on a low rack for about 1 1/2 to 1 3/4 hours, or until a wooden skewer inserted comes out clean. *Sorry this post is late, but at least it will be here for next year! St Anne, "Flowering, Fruitful Rod of Jesse"
This year for St Anne's feastday we have a beautiful theme of 'The Flowering Rod of Jesse". It is an ancient title connected to Our Lady as well as St Anne. St Anne's body was removed from Jerusalem when Lazarus, Mary Magdalene and Martha were cast out upon the Mediterranean Sea without oars by the Jews who were persecuting the very early Christians. They were miraculously guided to the shores of France and there St Anne's body was eventually hidden in the town of Apt until it's miraculous discovery by Charlemagne. "St Anne's body was then placed in an opening in the wall excavated from a subterranean gallery known as the Antrum Antiquum, which had originally been a branch of the catacombs. It was reached by a short flight of steps and hedged in by the cathedral ramparts. 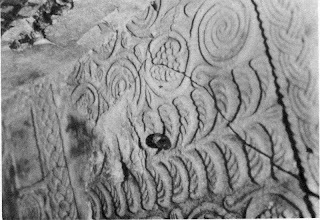 This wall opening, which would now become an ossuary, would be sealed in and not marked in any way; but on that part of the passage ceiling which was directly beside it a design would be carved, intelligible only to the initiate. "St Anne, Grandmother of our Saviour, pray for us." And continues: "St Ane, Root of Jesse, St Anne, Fruitful Vine....pray for us." Personally, we require no further confirmation of our belief that this became St Anne's last resting place. But to the doubting Thomas-or Thomasne, as the case may be - has only to look at the slab beside the one which shows the root of Jesse and the fruitful vine." Father: We all rejoice in the Lord. As we keep holiday in honour of blessed Anne. Of her whose feast fills angels with joy, And sets them praising the Son of God. Father: Spotless Anna, Juda's glory, Through the Church from East to West, Every tongue proclaims they praises, Holy Mary's mother blessed. All: From thy stem in beauty budded Ancient Jesse's mystical rod; Birth from thee received the Mother Of the almighty Son of God. Below is the very simple but effective cake we made to symbolize the flowering rod of Jesse. 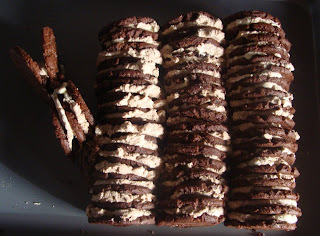 It is a Chocolate Ripple Cake and you use the following ingredients. I dipped each biscuit quickly in milk and shook off the excess. With a flat knife I applied whipped cream to one side of each biscuit and joined them together on the pan as you can see below. I made three rows and then fashioned a few on the side to create the side stem. Once the shape is made, I lightly covered the whole biscuit creation in whipped cream. Then I covered the cream in grated chocolate. I just bought lollies that could be used for creating leaves, grapes and flowers. 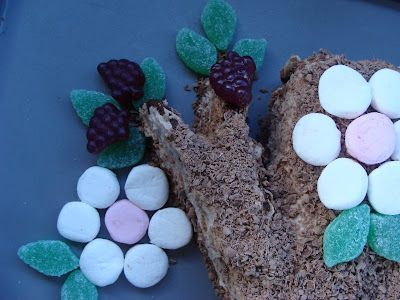 I used marshmallows cut in half for the flowers seen below. Then it is put in the fridge until ready to serve, in our case we will serve it up tomorrow on St Anne's feast day! This is a very quick and simple recipe that will visually delight the children and will give you ample opportunity to explain the religious connection of the Flowering Rod of Jesse to the wonderful and blessed St Anne, Grandmother Our Lord. 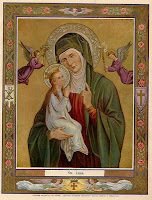 St. Anne is most traditionally seen wearing green and red. Little girls in Louisiana named for St. Anne used to wear red and green ribbons in their hair on her feast day. We made some for my girls that you can see here. Since it is summertime, when we think of green and red, we think of watermelons. 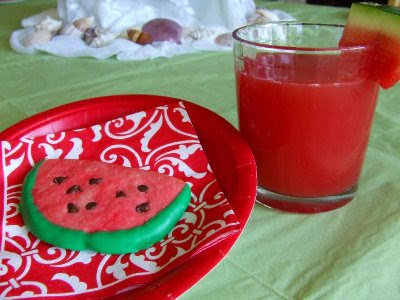 So in honor of St. Anne's colors, we made watermelon cookies and quenched our thirst with watermelon lemonade. The French have a great devotion to St. Anne and love to celebrate her feast day with seafood. Maybe consider making your favorite fish recipe for dinner! This coming Sunday, July 26th, is the feast of St. Anne, the mother of the Blessed Virgin Mary and patron of homemakers. 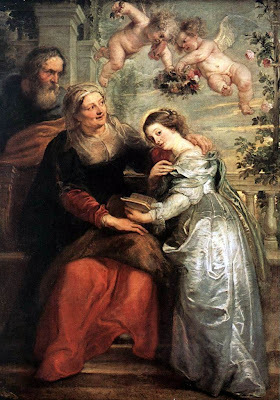 I have always loved Saint Anne and choose her as one of my Confirmation name saints. Since her feast day is coming up I have been looking for various ways to celebrate this year and I am anxiously awaiting to see what else Charlotte has to suggest! When I was looking through Cooking With the Saints I noticed it had a couple different recipes in honor of St. Anne: one for Crème Sainte-Anne (St. Anne's Cream) and one for Anna Torte (Gâteau Sainte-Anne). The Crème Sainte-Anne looked delicious and seemed quite similar to flan, which my husband loves and I am terrified to make after my disastrous last attempt! So, I decided to give it a trial run to see if I would be able to pull it off for her feast. The recipe ended up being fairly easy and turned out delicious. I really liked the flavor that the macaroons added. I plan to double the recipe when I make it again on her feast. Butter 4 ramekins. Put half the sugar in a pan and moisten with 2 tablespoons water. Bring to a boil and cook to amber caramel. Pour the caramel into 4 ramekins, to make a thin layer in each, and allow to set. Place a thin slice of butter on the caramel in each ramekin and sprinkle each with the chopped macaroons. Heat the milk to the simmering point. Whisk the egg, egg yolks and remaining sugar until creamy. Beat in the hot milk and pour into the prepared ramekins. The macaroons will float to the top. Stand the ramekins in a tray of simmering water that comes halfway up their sides. Bake in a moderate oven at 325°F (160°C) for 20 to 25 minutes until set. Allow to cool, loosen edges and turn out onto a plate. 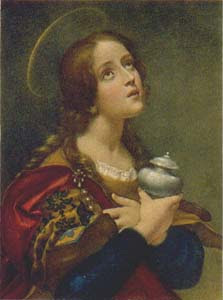 July 22nd marks the feast of St. Mary Magdalen, the first witness to the resurrection of Jesus. Last year Ruth shared a recipe for Madeleine's in honor of her feast day. Since I never did get around to ordering a Madeleine Pan , I've decided to try baking the recipe for Magdalenenstriezeln (St. Magdalen Fingers) found in Cooking With the Saints . The author shares that it is an "old German recipe for almond-covered cookies. There are quite a few German recipes that associate almonds with Mary Magdalen." They sound fairy simple to make and look delicious! Use an electric beater to cream butter and sugar until light. Add eggs 1 at a time and continue beating. Add sour cream. Finally, fold in flour. Butter baking sheet and spread mixture finger-think onto it. To make course sugar, crush sugar cubes with a rolling pin. Cover dough with slivered almonds and the course sugar. Bake until golden brown at 350°F (175°C) for about 35 minutes. While still warm, cut into pieces as long and as wide as a finger. Saint Mary Magdalen, woman of many sins, who by conversion became the beloved of Jesus, thank you for your witness that Jesus forgives through the miracle of love. Here is a simple morning treat I made for my children today, in honor of the feast of Our Lady of Mount Carmel. I used our Cocoa-Latte Hot Drink Maker (this is such a fun machine!) which heated, mixed, whipped, and frothed our caramel milk perfectly. Update: Ours is no longer available. You can find a similar model or a milk frother here. 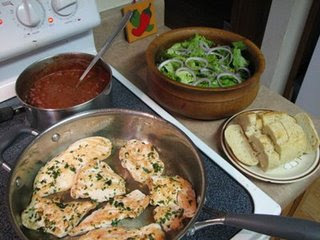 Prepare one serving at a time by adding 2 Tablespoons syrup to 8 oz. of heated milk. Make a delicious cold Caramel drink by using cold milk. I have often resorted to the bundt cake on feast days because it makes such a lovely crown. On St. Elizabeth of Hungary's feast day, we made a Hungarian jeweled crown and for today's feast day, the feast of Our Lady of Mt. Carmel, I made a caramel-glazed buttermilk pound cake into a lovely crown for Our Lady. Not perfect by any stretch, but it will be memorable for the children. After glazing the warm cake, I let it cool, whipped up a bit of decorator frosting and made some large rosettes with a bag and a tip. In the center of each rosette I placed a chocolate-covered caramel (what else?) and then another small rosette. In a large bowl, beat butter with sugar. One at time, crack the eggs into a small bowl and add to butter mixture, beating well after each addition. Add the lemon and the vanilla extracts. Add one cup flour along with baking soda and salt. Add one third of the buttermilk, beating well. Add one cup of flour and 1/3 cup buttermilk and then repeat with remaining flour and buttermilk. Scrape sides of bowl and beat again until completely smooth. Pour batter into the prepared pan. Bake in preheated oven for 80 to 90 minutes (do not open oven door until you are ready to check for doneness). Check for doneness with a toothpick. Let cool in pan for 10 minutes, then turn out onto a wire rack and cool completely. Combine white sugar, buttermilk, soda, syrup, and butter in a medium saucepan over medium heat and bring to a slow boil. Boil without stirring for 5 to 7 minutes, or until icing starts to turn dark. Do NOT allow icing to reach soft ball stage; icing should be caramel in color, but not sticky like caramel. Icing should be easily pourable. Cool for several minutes. Whisk in vanilla and powdered sugar until smooth. Pour through a sieve into a measuring cup with a spout. Slowly drizzle the icing onto the cake, allowing it to drip slowly down the sides. If you want a perfectly smooth finish (which I did not achieve) start at the peak of the cake and drizzle all the way around moving out a tiny bit each time you complete a circle. Do the same inside the peak but do not go back over the same area twice. To decorate, using stiff decorator's frosting in a bag with a rosette tip (see note below), make a 1-inch wide by 1/2-inch high rosette in six or seven places on the top of the cake (six was about perfect for a bundt cake, but if you used a tube pan you may be able to fit more). Place a chocolate covered caramel on each rosette and then top each caramel with a small rosette. Place in a cool place until serving. Note: You can using canned frosting or make a small recipe of decorator frosting using 2 T. butter whipped with 1-1/2 cup powdered sugar and several teaspoons milk. Whip until fluffy. July 16th is the feast of Our Lady of Mount Carmel. 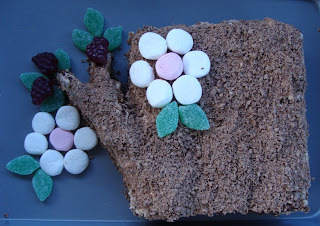 Last year, inspired by Anne, I made a Brown Scapular Cake with the help of my little sister. My children loved it and asked if we could make another one this year. I was a bit worried on how it would turn out since my sister moved out of state and couldn't drop by to draw Our Lady for me, and I also seem to have some sort of nerve problem in my left hand which made it very difficult to keep my hands steady. In the end, despite all the little flaws, my children were thrilled and are so excited for tomorrow. ☺ Nevertheless, next year I think I might just decorate it as a Sports Scapular! I plan to serve the cake with some Vanilla Ice Cream, topped with some caramel sauce. Yummmm!! 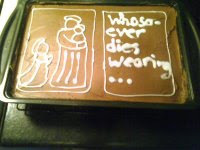 This cake is from Anne, who inspired me in the first place. 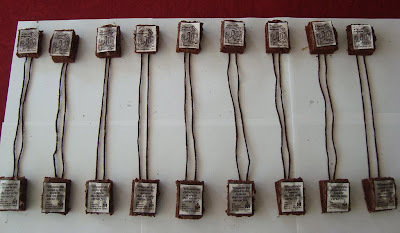 She creatively used two round chocolate mud cakes cut into rectangles and made the scapular's straps from some of the remaining cake. She them laminated the traditional images and placed them on top of the cake. It turned out beautiful Anne! 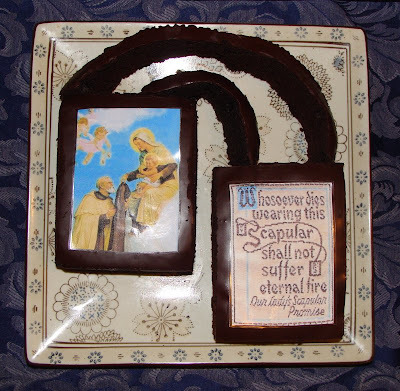 Here is another scapular cake, this one from Harmony at Wholesome Feasts. It too turned out just lovely! Thank you all for sharing your cakes with all of us! 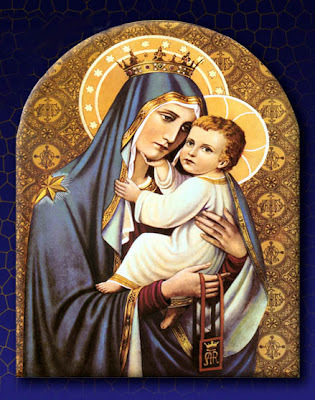 I hope you all have a blessed feast of Our Lady of Mount Carmel!